How much is a logo worth? When talking to a potential client, one question we often hear is, “How much does a logo cost?” This is one of the most common questions in design and the hardest to give a concrete answer to. Out in the free market, the answer is a logo costs somewhere between $0 and over a $1 Million. The real answer is how much is a logo worth? A famous anecdote is that the Nike Swoosh, a logo that is probably worth over a billion dollars today, was originally created in 1971 by a design student, working for $2 per hour. Carolyn Davidson, a graphic design student at Portland State University, submitted a bill for $35 for the final Swoosh logo. Even adjusted for inflation, that amount is only about $180 today. Compare that to the efforts of Cingular wireless to acquire AT&T, change their name to Cingular, then back to AT&T. This process has been estimated to have cost over $4 billion. Three years later, Cingular went back to AT&T, for a reported cost of $2 billion. Granted they had to change the logo on all the trucks, phone bills, websites and other items, but it still goes to show how much it can cost if you make the wrong branding choice. For our clients, a logo is often central to the way their business is perceived. It is printed on their business cards, checks, brochures, and maybe even a drink koozie. Their logo is on their signage, vehicles and other outdoor advertisements. It gets reprinted in magazines and by third-parties. While the cost of changing it is probably not anywhere near $4 Billion, there is still a lot invested in getting it right the first time. For all these reasons, we believe that it is important to spend the time to produce a logo that will go the distance. Our process involves a number of steps, but it is really more of an iterative process than a step by step process. We are going to show you the steps, we took with a new client and let you in on each step including the artwork we developed at each step. It was a bit of a challenge to get our designer Chris to let anyone see his rough sketches, but he finally agreed. 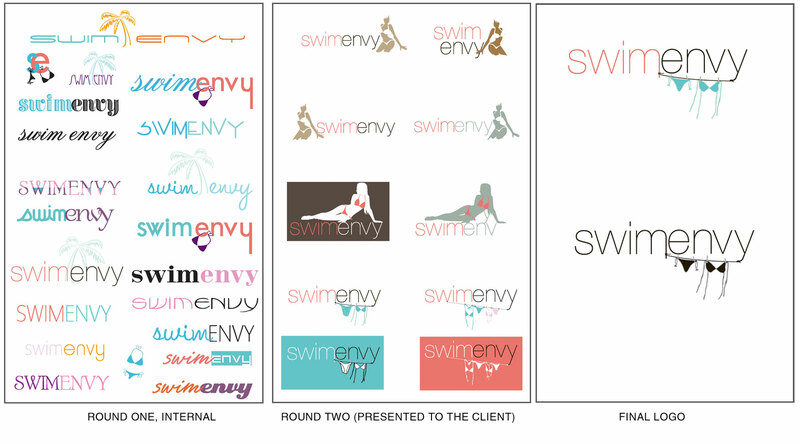 The following art is for our new client Swim Envy, an online retailer of designer swim suits and accessories. The logo process starts with listening to client. We talk with the client and determine what they like and what their goals are for the new logo. Most clients are great at telling you what they do not want, but often can not as easily articulate what they want from their new logo. For Swim Envy, we started by developing a profile of the target customer. We developed a list of terms that described the company, the brand and the consumer. Our client also provided us with some logos that she liked and commented on some she did not like. The next step is designing and redesigning. Chris started with a whole bunch of type styles, images and colors. He made a large sheet that had a ton of options. Chris, Nathan and I discussed what we like and what to focus on for the next round of design. From that we provided some examples to the client, who choose the final direction for the new logo. The final version of the logo was tweaked and retweaked. The clothes line had more slack put in it, we added clothes pins, the letters were changed slightly. With each iteration, the logo got closer to completion. Only then the logo is finalized, we were able to print the business cards, stickers with for the products and shipping boxes and letterhead with confidence that there would not be any changes. This entry was posted in Design and tagged . Bookmark the permalink. How do you get over 50% open rate on your next email campaign?